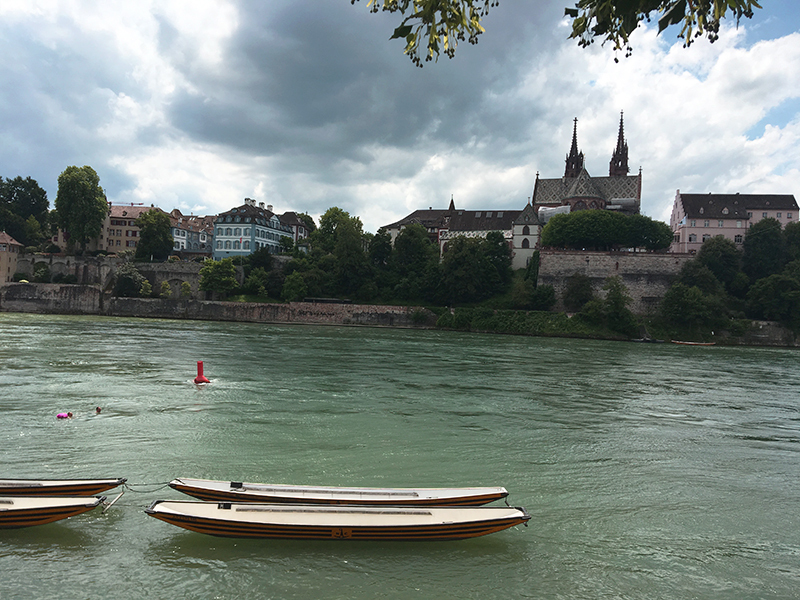 Come discover 10 things to do in Basel, Switzerland! Everything you need to know on what to see, where to eat, what to do! And all of these addresses gathered in a free Google map just for you. I traveled there for 3 days during Art Basel (art fair), which is to me the perfect time to visit the city. You can enjoy the art fair and discover more art thanks to all the pop-up events going on at the same time. It never ends. Another plus: institutions have special hours during the fair, they are more likely to stay open late. More art, I told you it never ends. To know more about my visit at the fair read my recap here. Don’t know what an art fair is? Click here to fall down the rabbit hole. 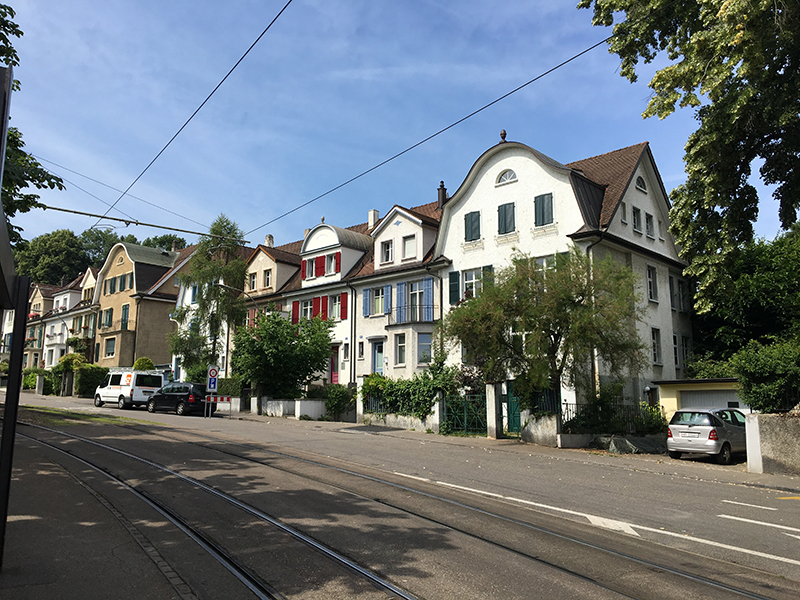 In this post I will also indicate the entrance fees for the museums, however if you have the Basel card it is 50% off! More info on that in the “Tips” category of the article. What an amazing institution! 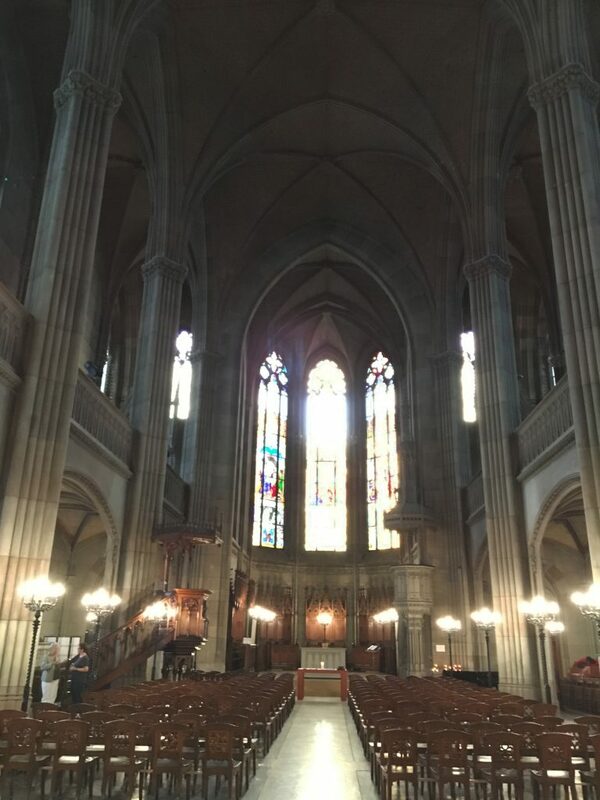 A must-see in Basel. 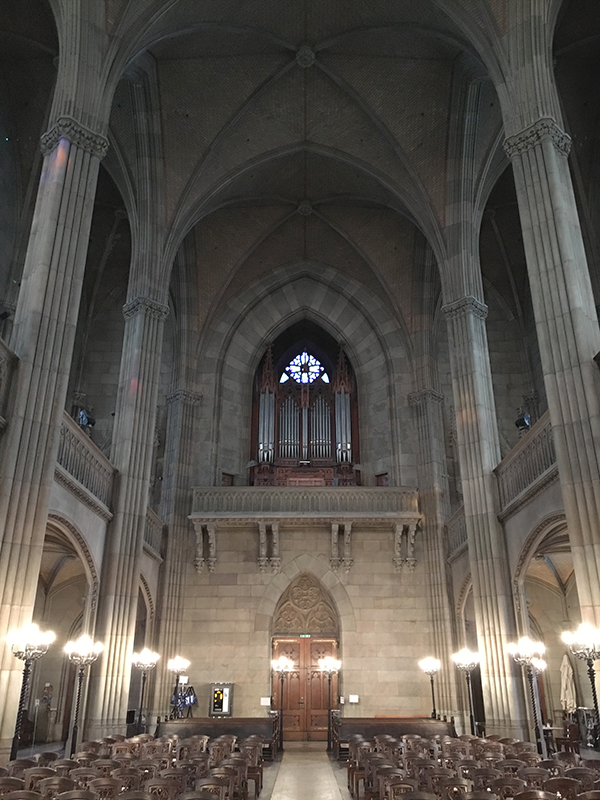 It is up north of the city center, you can easily get there by tram in about 30 minutes. Its designed was created by worldly acclaimed architect Renzo Piano (he also designed the Centre Pompidou in Paris). Located within a beautiful park enjoy wonderful collections, exhibitions and a bit of greenery for a nice picnic. 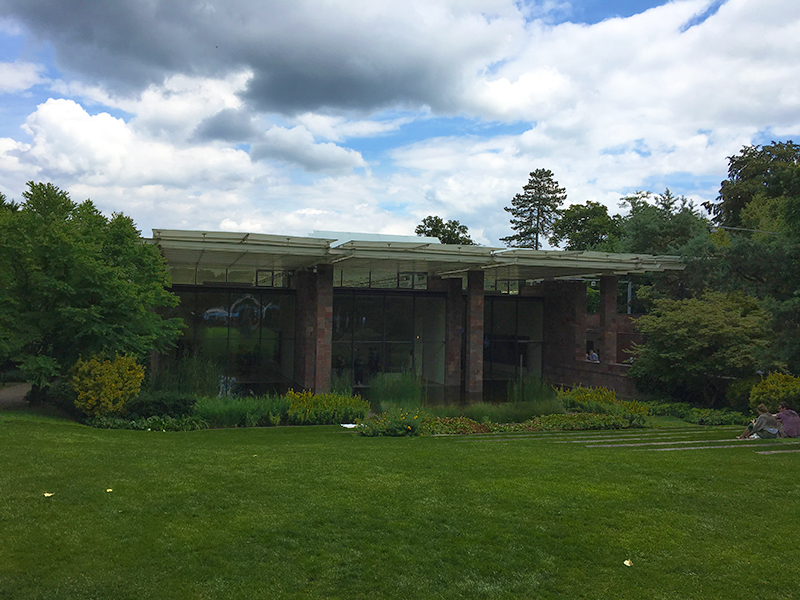 The exhibition space is dedicated to modern and contemporary art and is open all-year-round. This museum is composed of 3 buildings, each dedicated to a specific subject. Hauptbau is the main, historical venue which opened in 1936. There you will find the museum’s collection on medieval, Renaissance and art from 17th, 18th, 19th centuries. Gegenwart is dedicated to contemporary art. 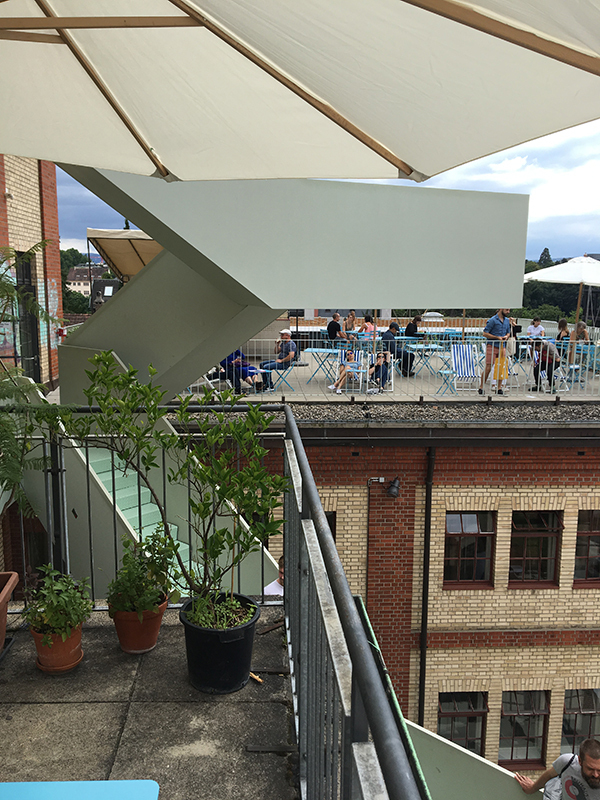 Neubau, the most recent building, opened in 2016 and shows special exhibitions and art from the collections. On its second floor there is a presentation of art after 1950. Free: every Tue, Wed, Fri, and Sat from 5pm to 6pm and on the first Sunday of every month from 10am to 6pm. 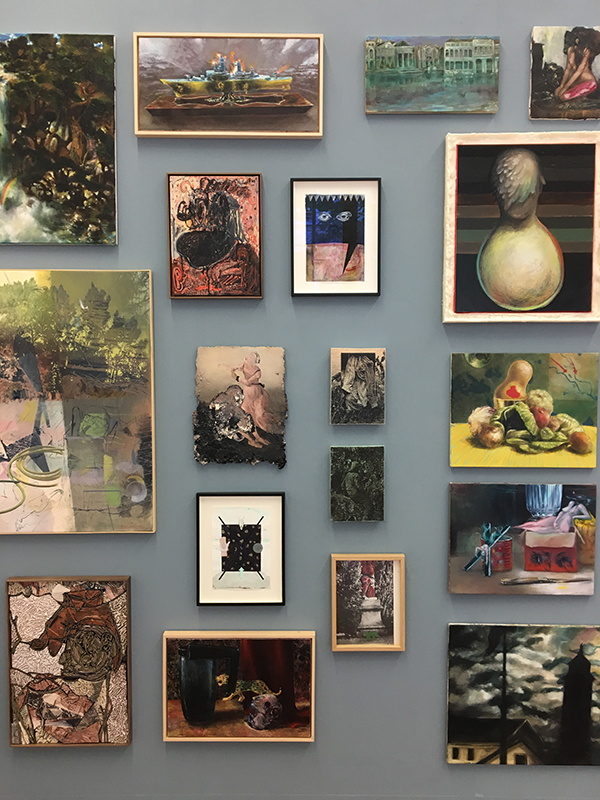 An amazing fair of up-and-coming, avant-garde galleries and artists. There you will discover amazing art in a more human-size space. Several restaurants and snacks are on site, a very good spot for a little break is the terrace café with its lounging chairs. Without forgetting the great view of the city. Other fairs happens during Art Basel: Photo Basel for the image lovers and Design Miami Basel for the sleek-amazing elements of decor. There is plenty more art to see! I wish I had the time for these places, I will definitely see them next time. My feet did not want to carry me any longer. Literally. You can also get to the top and enjoy a beautiful view of the city. Which you won’t find a picture of, here on this blog, since I got scared. Let me tell you about these stairs. I would not recommend it if you are afraid of heights. Or at least don’t go there alone, which I did. I thought that I would be stuck, by myself, in the dark, with no one to come and get me. Very lonely moment. Yep this is not a joke! Get in that water in the middle of the city! Unfortunately I did not have the time to try this. It is definitely on my bucket list for my next time there though! All you need is a little watertight swimming bag, which you can find everywhere, to put your stuff in and cross the river. More safety information here. I wonder if some day we’ll do the same in the Seine in Paris? Seems rather unlikely considering the color of it. Nice little old streets, full of beautiful corners and monuments. 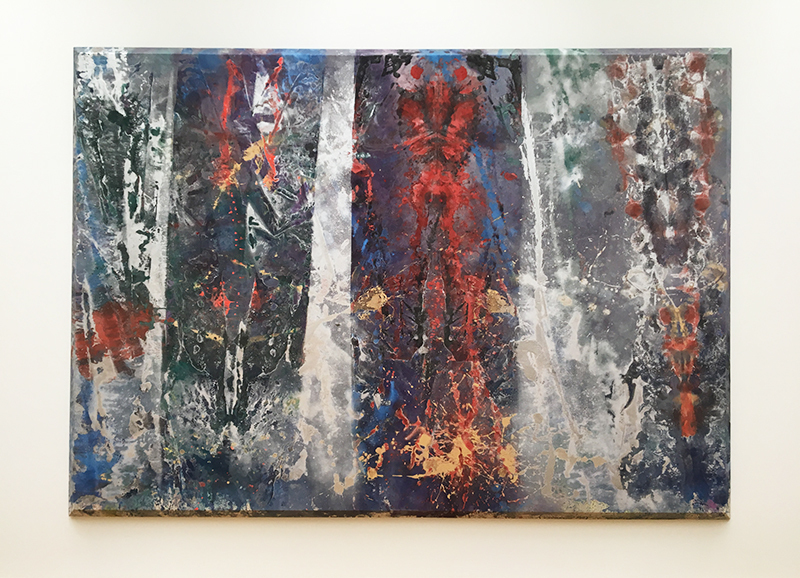 I saw it by doing the Parcours circuit of the Art Basel fair. On the google map you will find the sites worth checking out! A district for pedestrians right on the bank of the river. 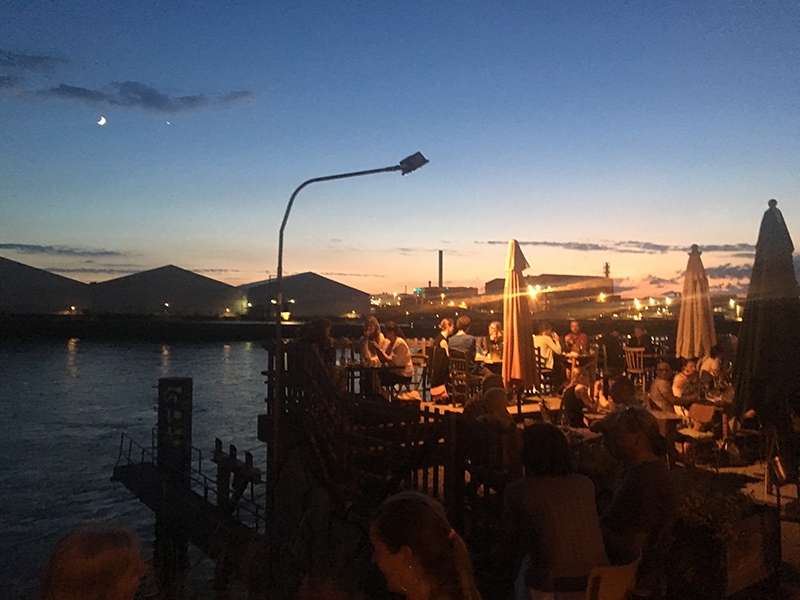 It is such a cute spot, many outdoors bars and restaurants overlooking the Rhine. I would say go there early, we only got sandwiches after 10pm… Early birds. And get ready to dance, they also have outdoors dj sets and clubs. Everybody was there during the fair. A Thai restaurant with a cute outdoor space. Food is good and well-priced. Careful they don’t take reservation and it can get crowded. This one was recommended to me by a local. I went there for the bar, they have a cool underground place for dancing and I think concerts as well. Apparently food is also good and cheap! Let me know what you think of it if you try it! If you are traveling on a budget and get afraid on the cost of accommodations keep something in mind. Transport will be free. Well more like: included in your fee. When you pay for a hotel/hostel/etc. you automatically get a “Basel Card”. This is awesome, it will allow you to use public transport (no need to be bothered by bus and metro tickets), with it you get a 2h bus tour of the city, 50% off museums entrance fees, a ferry ride, access to WiFi spots in the city and so much more! More info here. This is the hostel I stayed at, it was a great place, the staff was very nice and welcoming. They have a little café and an outdoor space with no cars driving through so it is quite peaceful. Since I was going there for the fair, prices go way up during that time and I did book it late. It cost me around 84€ for two nights for a bed in a dorm. I do not care for a private room, I never stay there, I am always visiting the city or chilling at the café. Why would I spend extra-money (which I do not have) on a space I only stay in for a few hours of sleep? Another plus they are right next to a tram stop! More info on the hostel here. It is quite expensive to live in this city. If you want to spend less I would recommend to not care about bringing home souvenirs. Even small ones cost way too much. Also get cooking, make your sandwiches and get your food for breakfast at a supermarket it will always save you a few. I did travel with a homemade brioche in my suitcase and enjoyed it very much every morning. Especially when thinking about the € it did not cost me! Now for the extra fun part, click below to get the Google map I created with all of the addresses. I gathered the places I went to, the ones I found online with good reviews and the one which were recommended to me. I hope you will find it useful for your next travel! Subscribe to my newsletter to access all of the FREE Customed Google Maps I created. Enjoy! 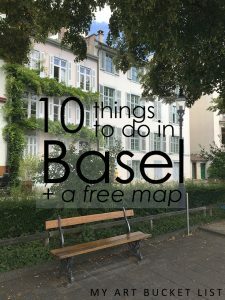 Let me know if you go to Basel and if you use the map!